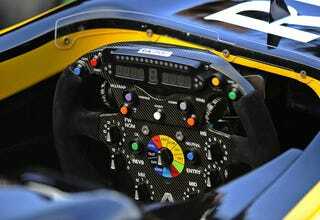 The wheel of the new Renault F30 is pictured during its presentation at the Ricardo Tormo racetrake in Cheste, near Valencia, Spain. Jenson Button of Great Britain and McLaren is seen outside his team garage. Jaime Alguersuari of Spain and Scuderia Toro Rosso prepares to drive the new STR5 for the first time. Rubens Barrichello of Brazil and Williams prepares to drive. Detail of an armco barrier. Lewis Hamilton of Great Britain and McLaren faces questions from the media in the paddock. Lewis Hamilton at the wheel of the new McLaren MP4-25. A Bridgestone tire engineer shaves and cleans a used tire. Michael Schumacher of Germany and Mercedes prepares to drive. The pit board for Pedro de la Rosa of Spain and BMW Sauber. Sebastien Buemi gestures during the presentation of the new Toro Rosso STR5 before the first Formula One test. Jaime Alguersuari drives the new STR5 for the first time. Felipe Massa of Brazil and Ferrari in action. Felipe Massa drives during testing. The nose of the new Sauber C29 during the car's unveiling. Lewis Hamilton during his first test of the McLaren MP4-25. Robert Kubica (L) and Vitaly Petrov pose during the presentation of the new Renault F30. Sebastien Buemi leans on a pit wall during testing. Michael Schumacher watches track action during testing. Scuderia Toro Rosso's STR5 in the garage. Nico Hulkenburg of Germany and Williams. Pedro de la Rosa is pushed back to his garage at the conclusion of testing.